Sometimes it’s a little difficult to get a good corn muffin recipe. I’m partial to General Mills brand over making from scratch. I made the Northern one in Joy of Cooking a few years back – that was after trying their Southern one which was decidedly DRY. Makes five big and one tiny muffin – it’s just John & I – if you want more just double it to make eleven big ones. Combine with dry ingredients just until wet. Spray muffin tin. FILL to the rim with batter. Sugar in the Raw – I like a sparkling sugary crusty top! Bake at 400 degrees for 20 min or until golden brown. 400 degrees – I added it – thanks for noticing! Thanks for the plug. I’m glad you like the recipe so much. Your version came out beautifully! I especially like how visible your sugar is on top… makes me want to make them again. Oh, look at the pretty sugar on top! 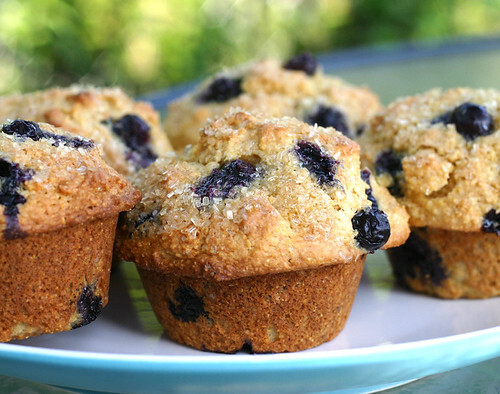 I want to peel the tops off these muffins right now. 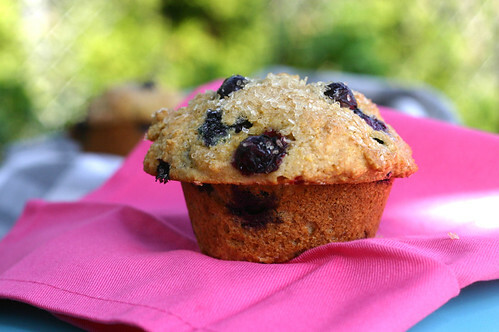 I just made these because I was so in love with your picture (and I had fresh blueberries). They are excellent! By the way, I doubled the recipe and it yielded around 18 muffins. Oh Lily how KIND of you! Thanks so much for commenting and saying so. Love your mix of flours in the recipe too. I’m printing this one out. Thanks!